in the occasion of Giovanni Bachelet’s 60th birthday, you are warmly invited to the workshop “Computer Simulations for condensed phase systems: from correlated electrons to novel materials” to be held at the CNR Headquarters in Rome, on May 4-6, 2015. 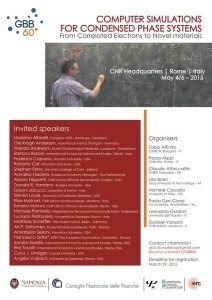 Massimo Altarelli, Ole Andersen, Wanda Andreoni, Stefano Baroni, Federico Capasso, Roberto Car, Stephen Fahy, Annalisa Fasolino, Alessio Filippetti, Don Hamann, Gianni Jacucci, Steve Louie, Elisa Molinari, Saverio Moroni, Michele Parrinello, Luciano Pietronero, Matthias Scheffler, Ari Seitsonen, Annabella Selloni, Francesco Sette (to be confirmed), Sandro Sorella, Erio Tosatti, Cyrus Umrigar, Angelo Vulpiani. The poster session is open to all participants. Students, former students, friends, colleagues of Giovanni, as well as those who are interested in learning more about ab-initio simulations are warmly encouraged to participate. Since our mailing list could have missed some of them, we ask you to forward this email to those who you feel might be interested in this workshop. On the other hand, we apologize if you were caught by mistake into this mailing list. If you intend to participate, we kindly ask you to register as early as possible, and in any case before the 31st of March, at http://bio.phys.uniroma1.it/GBB60/, where further information on the workshop (program, exact location etc) is available. When registering, you may submit the abstract of your poster (if any) and also reserve a seat at the workshop dinner (to be held on Monday, May 4), if you wish to join it (at your own expense).